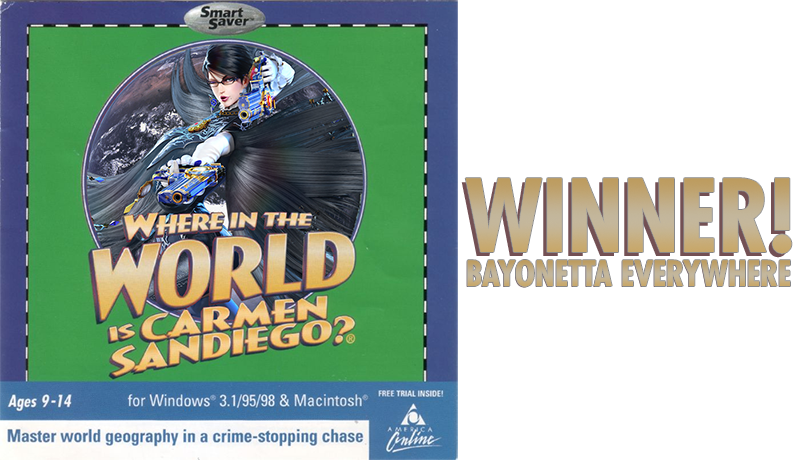 Kotaku 'Shop Contest: Bayonetta Everywhere: Winners! Earlier this month we found out that M-rated action star Bayonetta would be one of the final competitors added to Super Smash Bros. on Wii U and 3DS. I asked our image-manipulating community to put her in all the games. They did not disappoint. We had many outstanding entries, though several of them wound up disqualified. My exact words were “ something recognizable as Bayonetta is in some sort of video game”, so if you went with a movie or historical photo or bucket of chicken, great job! Also, bad job. I love you all, but guidelines are there to guide and be lines. My favorite game-themed entry comes from good old Sillstaw, who did something naughty to a piece of classic edutainment. I’ve a feeling young boys and girls would have looked much harder for this version. Possibly a controversial choice, but I am an old man. So old. Frol — for the logical choice. Spencer — because we’re only allowing one of these. Berfince — because bullet boots, bullet heels, what’s the difference? Spencer — this combo also works, though not quite as well. That’s it, the final regular Kotaku ‘Shop Contest of 2015! Note that I said regular. You old schoolers know what comes next. Tune in tomorrow!